« Art Adventure: Clay Play! Santa’s workshop is in full swing, and there is so much to build! Join us to build three projects using REAL tools! In addition to one-day camps, we’re also offering three drop-off workshops this Winter Break! Workshops run 10 AM to 12 PM with no extended care. Cost is $18 per workshop. (Members get a 10% discount!) Space is limited, so sign up early! 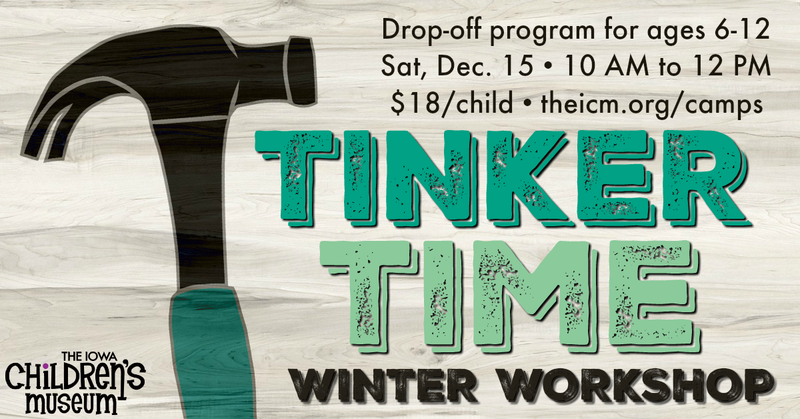 View all Drop-off Winter Workshops. 7 hours ago Just a reminder that we will be closed this coming Sunday (April 21). But we will be open 10 AM to 6 PM on Monday (April 22). 7 days ago Tomorrow is Dare to Care Day with the University of Iowa Association of Nursing Students! Join us from 10 AM to 1 PM on Saturday, April 13, 2019, to learn about things like handwashing, sun safety, vital signs, first aid, and exercise! There will be activities throughout the museum exhibits. This event is included with paid admission to The ICM.